If you have ever seen a picture of Chiang Mai then there's a bright possibility that you have seen a picture or two of thousands of beautiful lanterns adorning its night sky. Loy Krathong is one of Thailand's most popular festivals. 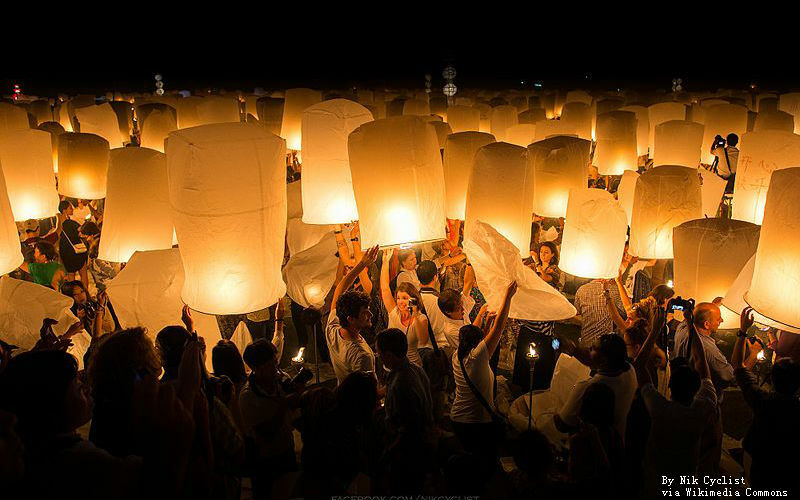 Let me tell you in detail about what Loy Krathong lantern is and what's the purpose behind releasing them in the skies? 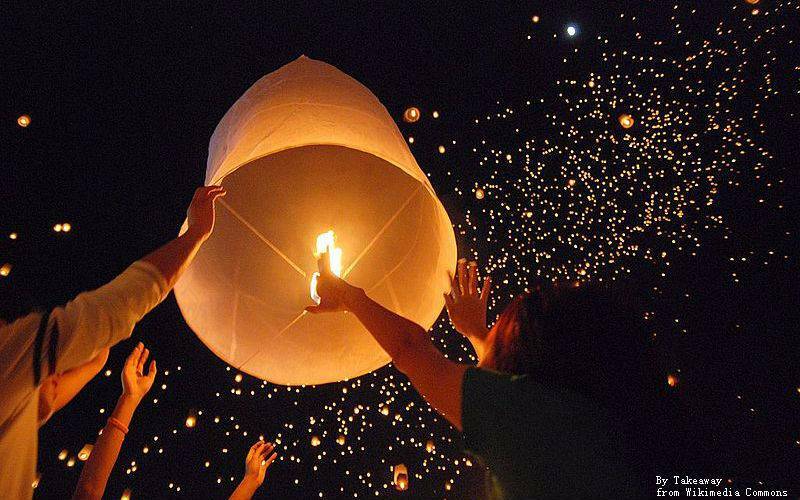 When to see and release loy krathong lantern? The answer is that you will see thousands of bright lanterns in the skies In Chiang Mai during the Krathong festival. It follows another popular Thai festival named Yee Peng which is another Lantern Festival. The only difference is that during Yee Peng Festival the lanterns are released in the flowing river instead of into the skies. During both the festivals the locals decorate their homes and Government places with beautiful flowers and lantern decorations. Why floating and releasing the lantern? It is believed by the Thai that releasing a lit lantern into the sky is symbolic to washing away the sins committed in the past year. A lot of locals also believe as per Buddhist teachings that a wish made at the time of floating a lantern into the air comes true in the following year. Where to release Yee Peng lantern? The Krathong lanterns are floated into Chiang Mai's night skies. Everyone floats their lanterns on their own. If you are looking for somewhere where all release their lanterns at the same time giving a wow effect then the right place to head off to would be Mae Jo University. There's usually a fixed time over there every year when everyone releases the lanterns at the same time. Yee Peng is a popular Thai festival that takes place a week after the end of the Krathong celebrations. It is held more so for the benefit of the foreigners/tourists. Like Krathong, it also includes mass lantern lighting and floating into the skies. It has no fixed dates; they are released a little before the time of the event. 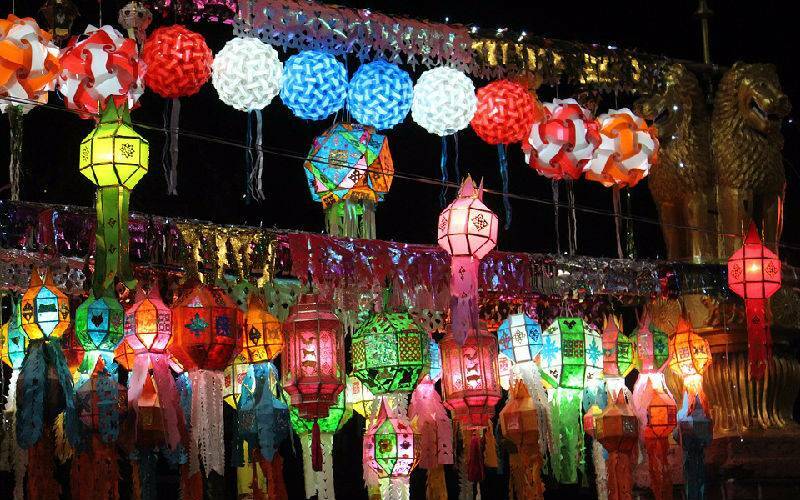 In the Northern parts of Thailand, you can find several types of illuminated lanterns. These are also known as Khom and are constructed with a paper. They include a tiny little cylinder inside that is there to provide safety to the paper from being burnt by the heat being emitted by the candle. Picture: Colorful traditional Thai lanterns. Roughly translated as the carrying lantern, it is the kind that is mostly carried by the Thai to the Loy Krathong parade that takes place on the final day of the festival. After the parade, it is taken to the temple building where it is hung as a decoration. Khom Kwaen that means the hanging lantern is the lantern that is used as a way of paying respect to the Buddha. They usually come in different shapes namely the shape of a star, a basket and a wheel to name a few. Then comes the Khom Paad lantern. This is an interesting lantern that usually comes in a circular shape and spins on a vertical axis. The axis moves owing to the heat from the candle. The outside of the lantern displays the zodiac signs. It is usually placed only around the gates of their temples and shrines. Last but not the least comes the most popular lantern is the Khom Loy. It is kind of like a little hot air balloon. The Khom Loy is the most popular Krathong lantern. It is a common conception in Thailand that these flying lanterns can wash away a person's transgressions of the past year and can bring good luck and good fortune in the year to come. But that is only if the lantern flies out of sight before the fire dies. The locals say a prayer before they release their lantern and have strong faith that whatever wish they have made is going to come true in the following year. You should know the proper way to release your lantern. After all, this is what you traveled all the way to Chiang Mai for. The preparations that precede flying the lantern in the air are quite important. First of all the entire process requires not one but two people. One person is needed to open the lantern while the second person helps in lighting it up. After lighting up the lantern make sure that you are holding it closer to the ground. This allows heat to fill up the lantern. Keep the lantern in this position for roughly a minute. You will instinctively get an idea when's a good time to lift it and release the lantern into the sky. P.S. Make sure to say a little prayer and make a wish for whatever you want. The Loi Krathong lanterns are very simple to make. They are made out of the bamboo stick. A big bamboo stick is used to make several small-sized bamboo sticks that are thinly sliced. Then the thin sticks are held together at a right angle with banana leaves tied tightly to hold it together. The respective square shape acts as a base for the lantern. Many tourists and locals end up buying their lanterns from one seller. Make sure you visit several stalls before you make a final purchase so that you know that you're not being “overcharged.” The bigger the lantern the simpler it will be to light and float. The bigger ones roughly cost somewhere around 70-90 BAHTS. There's no point buying in advance but be on the lookout that they do not sell out before you make your purchase as everyone's out to buy them. Handle them with care as they are very delicate.